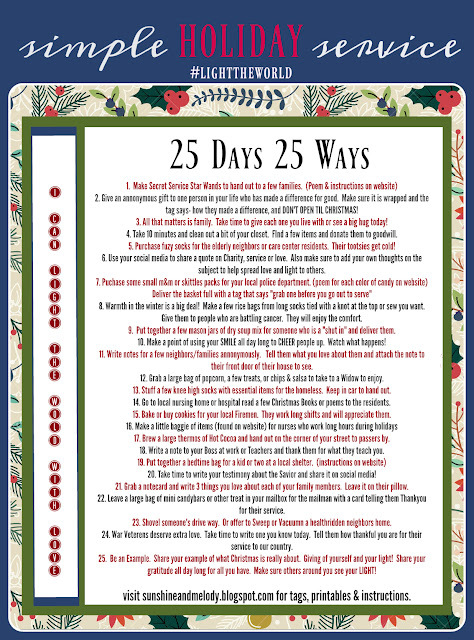 I'm SO excited to share my 25 days 25 ways service list this year. These are some of the daily service activities that my family will be doing this holiday season. "Here is an advent of simple yet heartwarming opportunities to serve others this holiday season. Remember it is not always having to do large projects that take days and weeks to prepare or collect items for. Many times, we can and should be involved in those efforts when collaborating with others. However, I am wanting to share ideas for each of us to take time daily to focus outside of ourselves, and turn our hearts to prayer while considering other people’s happiness!" I will have a list of tags, printables and instructions posted here throughout the month of December that will help you and yours carry out these wonderful ideas if you would like. Hi, I was so excited to see these ideas to #lighttheworld, but it says the download has been removed by scribd. How would i get a copy of it? Thanks so much!! We want to follow your suggestions this season~!! Hi. We are working on getting this fixed. In the mean time if you click on the image itself it should pull up clear and you can right click and save to your device.